French author and dramatic writer; brother of Jacques François Fromenthal Halévy; born at Paris Jan. 14, 1802; died at Saint Germain-en-Laye Sept. 2, 1883. After finishing a course at the Lycée Charlemagne, Halévy became a disciple and collaborator of Saint Simon, aiding in the foundation of his organ, "Le Producteur," and writing the introduction to his work,"Opinions Littéraires, Philosophiques et Industrielles," in which Rodrigues and Bailly also assisted. In 1831 Halévy was appointed assistant professor of French literature at the Ecole Polytechnique, but abandoned the position three years later. In 1837 he was attached to the Ministry of Public Instruction as chief of the bureau of scientific societies, and remained there until his retirement in 1853, after which he devoted the remainder of his life to literature. 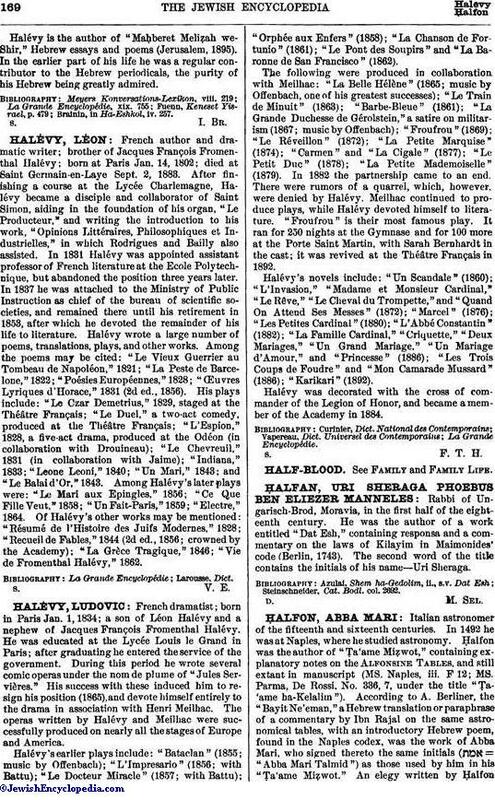 Halévy wrote a large number of poems, translations, plays, and other works. Among the poems may be cited: "Le Vieux Guerrier au Tombeau de Napoléon," 1821; "La Peste de Barcelone," 1822; "Poésies Européennes," 1828; "Œuvres Lyriques d'Horace," 1831 (2d ed., 1856). His plays include: "Le Czar Demetrius," 1829, staged at the Théâtre Français; "Le Duel," a two-act comedy, produced at the Théâtre Français; "L'Espion," 1828, a five-act drama, produced at the Odéon (in collaboration with Drouineau); "Le Chevreuil," 1831 (in collaboration with Jaime); "Indiana," 1833; "Leone Leoni," 1840; "Un Mari," 1843; and "Le Balaid'Or," 1843. Among Halévy's later plays were: "Le Mari aux Epingles," 1856; "Ce Que Fille Veut,"1858; "Un Fait-Paris," 1859; "Electre," 1864. Of Halévy's other works may be mentioned: "Résumé de l'Histoire des Juifs Modernes," 1828; "Recueil de Fables," 1844 (2d ed., 1856; crowned by the Academy); "La Grèce Tragique," 1846; "Vie de Fromenthal Halévy," 1862.